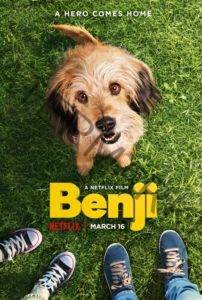 A modern day retelling of the classic, the story of Benji follows one orphaned puppy and Carter and Frankie, two capricious New Orleans school kids who strike up a friendship with the tenacious street dog. When danger befalls them and they end up kidnapped by robbers who are in over their heads, Benji and his scruffy sidekick come to the rescue. View Benji (2018) on Netflix.